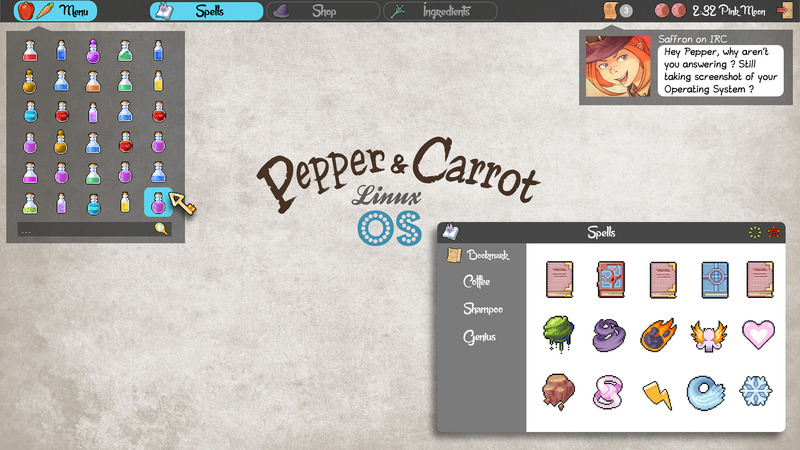 I'm preparing a new Linux distribution Ubuntu-based around the theme of Pepper&Carrot : Pepper&Carrot Linux O.S. The desktop environment is a heavy customization of Cinnamon, with the wonderful pixel-art icon theme from Henrique Lazarini . You can already test the beta version : peppercarrotlinuxOS_beta-0.2.25.iso version 32bit and 64bit. Burn it on a DVD, or write the ISO to a USB drive, it should be compatible with pretty many hardware ( based on LTS 14.04 ). Contributors welcome on my official Git repository . License: CC-BY David Revoy, www.davidrevoy.com, 1 april 2015 . Thanks for your work David! @Leonardo for the answer to your question, try clicking the link to the git repository. Sadly this is only a joke. This would have been so cool though. I really like what you did with the fonts, and these icons rock! might be of use to me one day even.